That ability, the one to stand there and pretend to engage a rampaging multiloquent freak in conversation is rare. Maybe Ann didn’t have it? Maybe she wouldn’t like me. I mean, I’ve never log-cabined anything in my life, not even in bad colours and well. I was nervous. I compensated by ironing my shirt, which should be some real indication of how far gone I was. 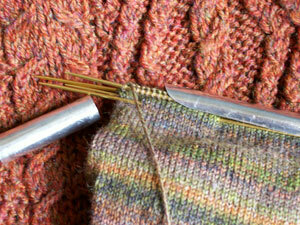 At the appointed hour I took the sock to the lobby and sat there turning the heel. Right on time, at the exact minute that she said she would..in walked Ann, and I have to tell you Kay, that despite seeing pictures of her and understanding on an intellectual level that she was not going to be Ann Patchett…it really does come as a blow. She was however, despite the lack of Patchettness, gracious and charming, and taller than I thought and I took a deep breath and got in her car. (The deep breath had the added benefit of Shutting Me Up for 3.4 seconds.) 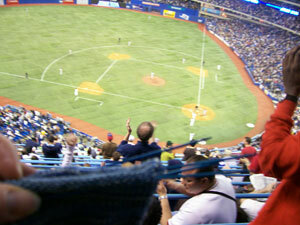 We drove off then, to show a wee Canadian sock a little Nashville, and I was pretty much instantly overcome. Like an idiot I sat in Ann’s car unable to have a proper conversation, because whatever Ann was saying, whatever I was saying, I was impelled by forces related to the long, dark Canadian winter to goggle out the window every two seconds and say something to the effect of “It’s so GREEN” or “There are leaves on the trees!” or “That man has no shirt on!” I’m sure that you have some idea of how this feels Kay, living in New York as you do, but my little brain simply cannot accept that there could be roses and peonies and leaves in full, luscious leaf in April. I’m sure Ann thought me quite stunned. Try to explain to her, will you? Ann had been charged with the solemn duty of finding local flavour to appease the sock, so we drove through Nashville, me agape, Ann poised and thoughtful, every inch a gracious tour guide. We saw many things Ann and I, and were even beset upon by grey squirrels in the park. It was funny at first. At first it was like Ann was Snow White, you know that perfect Disney moment in that movie when the fetching Snow White is in the forest and the birds and small woodland animals are drawn to her because of her goodness? At first it was like that. Then they got closer. Then they started rushing at us. It was when they got into a tree overhead (MUM! Rhododendrons are a freaking tree here! Not a wee bush that you coddle through the winter with a burlap blanket and heaps of snow in the faint hope of having 30cm of bush in the spring, but a TREE.) that Ann and I decided that our work in the park was done. 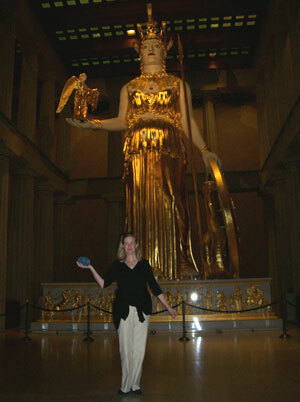 A gilded Athena of goddesslike proportions in the centre. Thanks for the loan of your blog buddy. She’s swell. If you hadn’t of snapped her up, I’d be all over it. I miss her already. PS. (And Kay can stop reading now) Because I don’t have it in me to answer the emails, here’s where I’ll be tomorrow. 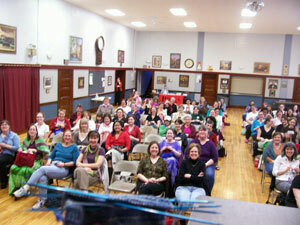 Lexington, KY – Bluegrass Book Festival. The Lexington Center, 430 West vine Street, Lexington KY. Speaking in the “Thoroughbred 6” room at 4pm. Today’s blog is brought to you by Yvonne. 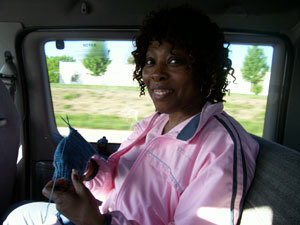 She’s a knitter I met on the shuttle (sorry, no taxi) to the airport this morning as I was leaving the very green city of St. Louis. She’s knitting a dog coat at home (my ability to find knitters in random places is scaring even me) and was very interesting (trust me. You have to be gripping to hold my attention that early.) Yvonne is that special kind of saint on the earth known as the Urban Math Teacher. She’s from Newark NJ, and if she’s your kids teacher, boy are you lucky. 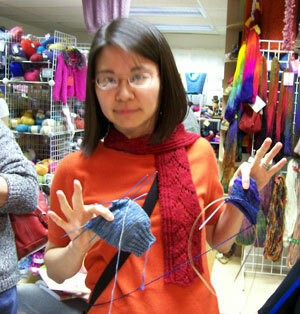 The guild and the knitters knew what to expect. 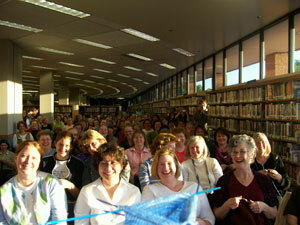 (We know about us) but the library kept looking at all of the people and you could practically see the thought bubbles over all their heads. Who came in line after Alison and introuduced herself as “nobody important”. (This appears to be code for “sadly-blogless” and I took her picture to assure her (however inaccurately) that bloggers are not taking over the world.) Not everybody has a secret identity, and I like it that way. She looks plenty important to me. Who had a business card for her blog. I think that’s pretty darned smart. Can you imagine how much easier it would be to explain to cab drivers why they need to hold the sock if I had a business card? I bet it would cut the number of funny looks in half. 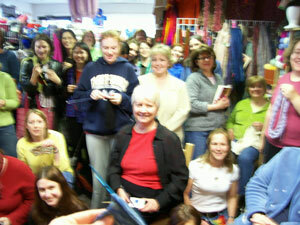 After the knitting party, the guild took me back to one of the nicest shops I have ever seen. 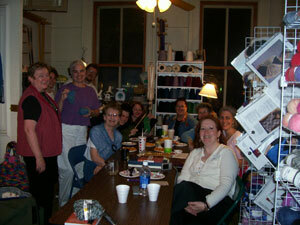 The Weaving Dept at Myers House and Barn. (Long name. Good shop. 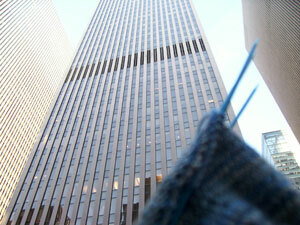 I saw a couple of looms and some coned yarn but that was all weaving had to do with it.) It’s a big rambling shop in an old house, and they yarn is in all different rooms. (Bathroom by the sock yarn alcove.) I loved it. I loved it more when they brought out the blueberry cheesecake. I say again. 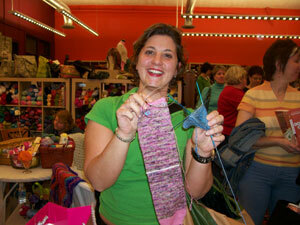 If you want to have a great knitting party, you need the St. Louis knitting guild. Last night, at approximately 9:15 pm, this sock (Yarn tucked inside, magic loop technique) was discovered abandoned and alone in the parking lot of the Library. It was cowering, lonely and at risk of acquiring some dirt, but thankfully (because it is wool) it was not cold. It was rescued, and has been entrusted to the temporary but kindly care of Timothy (my stalwart chauffer and fine knitter) If you lost this sock, please contact Timothy (before he gets attached to it) so you can be re-united. Your very nice sock misses you. PS. Suzanne? The Toblerone bar you gave me in Boston saved my life yesterday afternoon. I was starving, could find no food anywhere, couldn’t work the stinking vending machine, considered dissolving completely and was absolutely consumed with affection for you when I discovered three fuzzy lint covered chocolate triangles in the bottom of my purse (you know how things get fuzzy in your purse?) and have never been happier to see any food. Thank you. The cosmic purpose of the Harvard playing cards I received at the same time remains to be discovered. PS again, I put the details for where I’ll be in Lexington KY on Saturday on the tour page. When I found out I was going to Webs, I said “cool”. I love yarn stores. Bah. I thought. I get around. I may be a crappy traveller, fail to style my hair and have no idea how to manage a scientific calculator, but sweetpeas, I excel at yarnshops. 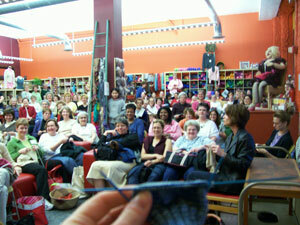 I have been in more yarn shops that most knitters. 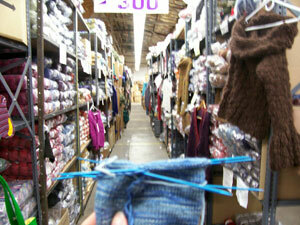 I’ve developed resistance to big yarnshops by being in hundreds of smaller shops. My life up until now was like a series of vaccinations to prepare me for Webs. I’m sure it will be big. I bet it will be good, but it will not floor me. I am a Yarn Harlot. That means something. ( I swear that when I saw that I reached out to steady myself for a second and saw – I swear it – grocery store shopping carts to hold your yarn. These people are onto something). I thought to myself that there has to be some down side. Something. This is an impossibility. There’s a catch. Like, sure there’s all that yarn in one place and it’s all a pretty good deal and some of it’s outrageously cheap…but I bet that a bunch of it is crap. Like at discount stores where you can get a pair of jeans for $3 but they practically dissolve in water? Like that. So I start sort of smugly going up and down the aisles with Steve (He’s a heck of a salesman. We saw some yarn that I liked and I said “Forget that. I can get that at home.” and he said “At this price?” The mind boggles. I think I took to shushing him after a bit just to protect the precious futures of my children.) and…brace yourselves. It’s good yarn. It’s Regia for SIX dollars. It’s Rowan….never mind. Go look at the website. I can’t speak of it. 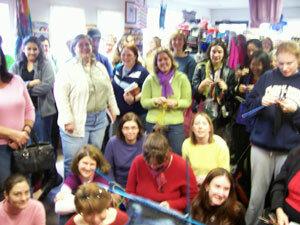 While I’m still boggling that the shop is huge, has good yarn and is bettering the world…it’s time to stand up and speak to the knitters, and I’m stunned as a sack of hammers and this is what I see. (I wish I could set this up for panoramic view to scare you as much as it scared me…) It took four pictures. I think it went pretty well. I’d know better except that I was busy bleeding out of my ears when the microphone quit it’s job half-way through and started feeding back screeching awfulness. (I knew this day would come.) A hotel lady came and fixed it, but not before minutes stretched into YEARS and I took this picture to capture the moment. The sock. Getting screwed over by a sound system. (Ironic, isn’t it? Considering that I live with a sound guy who’s sole purpose for living is to prevent the moment I just lived? Burning irony.) 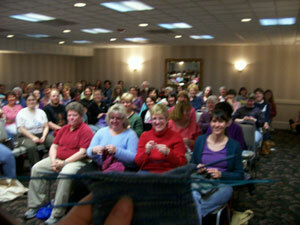 I finished the talk, raced everyone back to Webs and started meeting knitters. 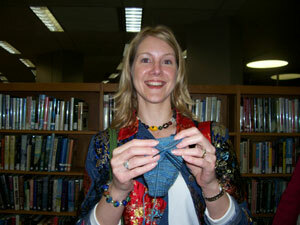 There was Stephanie from Storey publishing with her first sock. When it was all said and done, when Linda was ricocheting me across whole states to catch a flight and run home to my Joe and my girls I realized…there is no catch to Webs. Kathy and Steve are kind and good and have great yarn. They are sweet and socially responsible. They’ve hired Pixie to help, who’s totally clever and absolutely organized and was wearing a beautiful jacket. (I notice these things) and I got some great yarn (I’ll show you later.) 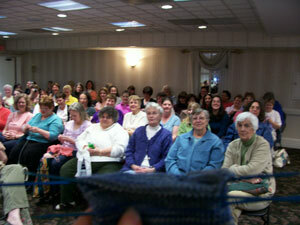 they totally rock the event thing, and knitters….if there’s a downside to Webs, I don’t know what it is. I love it there. When I am old, I shall live in the backroom at Webs and make myself a wool and mohair nest with a silk lining. It will be green and gold and soft. On Saturday it’s the Bluegrass book festival, and I promised details. I’ll be at booth 98 (Does that sound ominous?) from 10-12am, and from 3-4pm and then giving a talk in the Thoroughbred 6 room (that does sound ominous) at 4. Bring your socks. 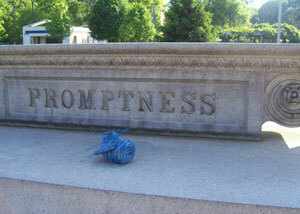 Bring your knitting. When I arrived in Canada on Saturday night/Sunday morning, I walked up to the Customs officer, handed her my Canadian passport and stood there. She said “Welcome home, what American city are you arriving from?” and I stood there and looked at her. For several minutes I said things like “Boston? No, Phila….no…oh, maybe Washington? I mean, I wasn’t in Washington but I changed planes there. What airports are in Massachusetts? 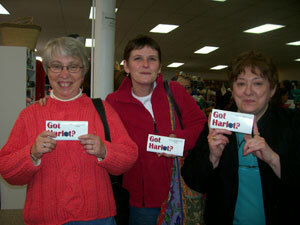 Was it Hartford?” We eventually checked my ticket stub. Hartford. (Which, for the record, I don’t think actually is in Massachusetts.) The last bit of that leg of the tour were so big and so fast and there were so many knitters and they were all so cool and there was so much yarn (I can’t tell you. So much yarn.) that writing a blog entry about it is formidable. I keep thinking of one of my favourite quotes from one of my favourite movies. 12:00 Cambridge. Linda and her kindly husband Jay (who was starting to look like he might be rethinking his affection for me by the end of it all) picked me up in Cambridge and trucked me to, um…(Hold on. I’ll call Linda and find out where I was.) Wild & Wooly in Lexington MA. This is a very nice store. (Big basement. Go to the basement.) I was shown nice things, interesting things (I may have bought a little of that Bearfoot I find so fetching) and I met this guy. I think his name was Jim. He’s the Noro guy. (I am ashamed to admit that my brain completely disregarded his name once I found out that he was the Noro rep. Apparently my brain only saves the really important information about people.) 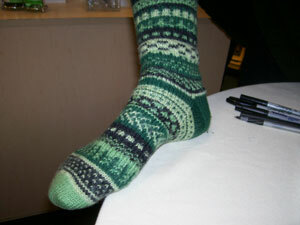 He goes travelling around with boxes and books and samples of the new Noro stuff and the new Noro colourways. I warned him not to accept my offer to help him carry the yarn to his car. As I post this, I guess I should have warned him to keep his car locked at red lights, since I’ve just shown a whole bunch of knitters what a man with a car-full of new Noro looks like. 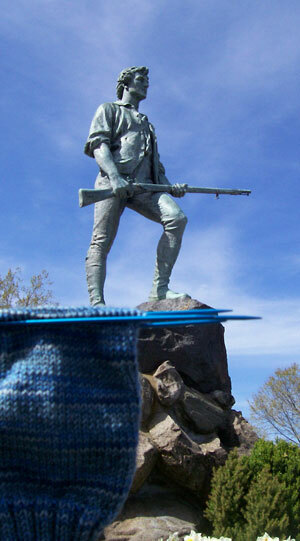 From there, the sock went to a local historical landmark. 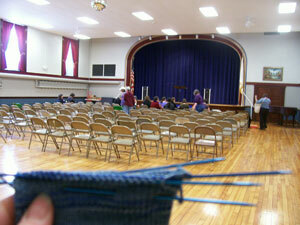 From here I was driven (again by Linda and the patient Jay) to the event at Classic Fibers of Grafton. The first thing I learn about this shop is that it is small. (This isn’t usually a problem with yarn shops. 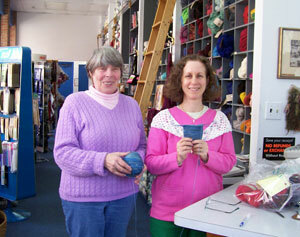 In my experience, yarn shop owners have an almost supernatural ability to pack yarn into a shop.) At first, my self-esteem tells me this is no problem. No-one is probably coming anyway. 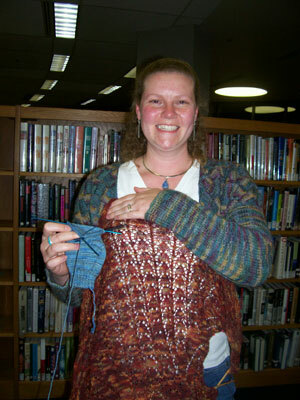 Wrong again harlot-knitter. 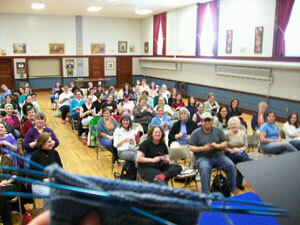 I arrive and am ushered in through a side door to find a crush of knitters. 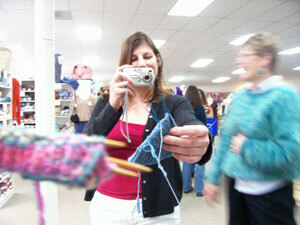 There are knitters everywhere. Everywhere. 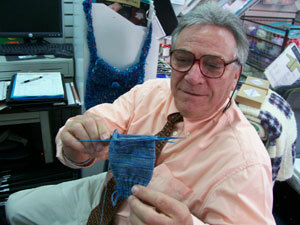 They are hank to skein, needle to needle. 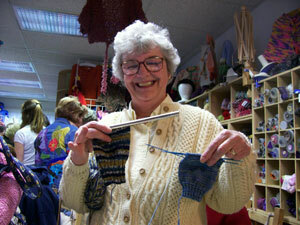 They are shopping, talking, knitting, laughing…there are a lot of them. I can’t even see them all they are packed in there so tight. I catch sight of Mamacate and Sandy in the back…a glimpse of Kat with a K‘s birch in progess drifts by, Claudia is on the floor in the front, Marcy beams at me from her corner, Laurie finds a spot somewhere, eaten up by the wave. Carole is somewhere back there, Kellee, Jackie, Maryse (I can see the top of her head) and it dawns on me that if I can’t see them, then they can’t see me…and wonder-Jay procures a stool for me to elevate my 5 foot self on to give the talk. Eileen, the very welcoming shop owner keeps smiling and being friendly and handing out cheese and crackers and saying that she wasn’t warned (two points for not running away even though she looked sort of surprised.) 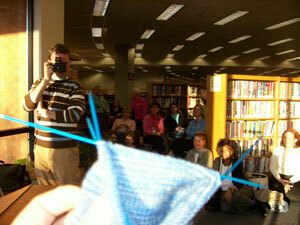 I start wondering if the knitters even want me to talk. I wonder if they would rather that I just signed so they could Go. Sit. Down. I teeter up on the stool and ask them. Talk. They say. Ok. I say. This is Paula. Paula had the coolest metal needle thingie. I was so impressed with it that she gave it to me. ( I tried to decline, but that Paula has conviction.) Check it out. Then you put the cap on and bingo. Hermetically sealed sock-in-progress holder that keeps your work from coming off the needles in your purse, poking a hold in your juicebox, or impaling the side of your leg purse. Seriously cool. (I know you’re going to ask. It came from Woolworks Ltd. at Jeremiah’s Antiques. email is woolworks@snet.net) This could save socks. Possibly lives. 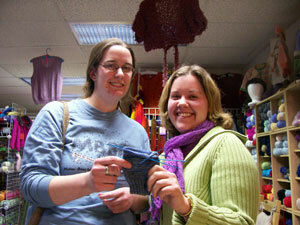 Kristen and Theresa med students who knit. Amy, making an introduction between my sock and hers. I was then carried away back to Linda’s house where I collapsed face down on her guest bed (in my clothes) for eight solid hours to brace myself for WEBS. Which was incredible, which I will tell you about tomorrow and you can read about while I’m on a plane on my way to St. Louis. I promise to never say there are too many chairs at an event again. PS. Grenyrn (Who are you really?) won the sockyarn with this comment left on my mystery message to myself yesterday. Hi Steph. Great to see you last weekend. 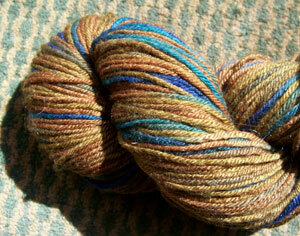 Just following up on that question I asked you re that green striping sock yarn. Also please don’t tell my son about this as I’m making the socks as a surprise for him. Thanks for leaving me the message that you would check on it. She totally sealed it with the fake email address. 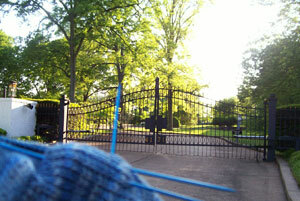 Email me your real name and address peaches…I’ll put the sock yarn in the mail. You guys all crack me up…and Rams? Pet? I’m spinning. I have no idea what this means. (Probably that I was delirious at some many points in the State of Massachusetts.) Check? Does that mean I did it and don’t need to worry or that it’s important that I check on L.mre? I’ve made myself nuts trying to figure it out, being particularly interested in “don’t ts” since it seems to be a warning of some kind. Is it a promise I made? Did I come home and “ts” when I shouldn’t have? Plus? Plus what? If I’ve already ts’ed what will happen if I don’t recall that L.mre? Striping? A) was present when I wrote that down and has any idea what I meant. B) Had a conversation with me about this note that I do not recall due to exhaustion, glee or wool fumes. C) feels that they may have insight into my mind and would like to guess. A ball of sock yarn goes to the best answer. (Note that I said the “best” answer, not the most accurate.) 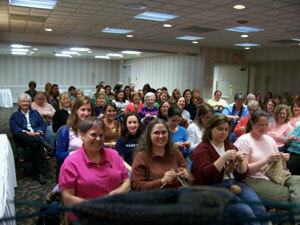 Knit event reporting will continue tomorrow when I can sit upright. I shall endeavor not to ts by avoiding modernist poetry until then. 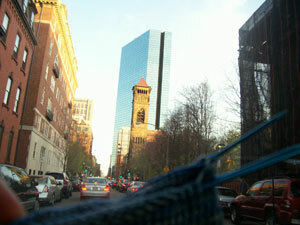 Back Bay, Cambridge…and a taxi. (seen here gracing the fetching carpet at the hotel) and learned that Julia couldn’t sell wool to shorn sheep. While Julia was dumping Circles entire sales bin onto the floor (that woman has no shame) I discovered this ball of yarn. 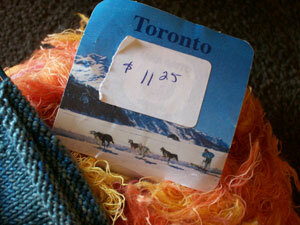 What about this yarn says Toronto to you? The glitz? The colour? The ARCTIC HUSKIES TRAVERSING THE MOUNTAINS? We pondered the depths of Red Sox fans souls, ate dinner and I ensconced myself at the College Club. 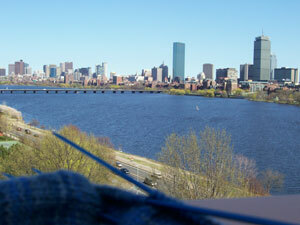 After an eight hour loss of consciousness, I woke up, knit a couple of rows on the baby sweater, packed my things and straggled downstairs to the reception room where I met and was charmed by the Boston Knitting Guild. 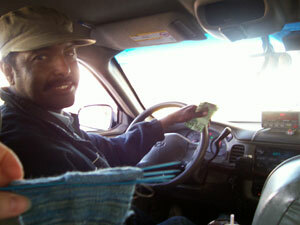 Today’s taxi blog picture is brought to you by Ahmed. 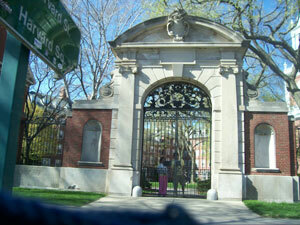 A very nice man who was kind enough to play tour guide on the way to Cambridge and showed the sock the Harvard dorms. and wound up (thanks Ahmed) at Porter Square Books, where I learned that they had moved the event to the Masonic Hall across the street. (Jane, who co-ordinated the event for the bookshop, said the best part of the whole thing was trying to explain to the Masons what she wanted the hall for.) 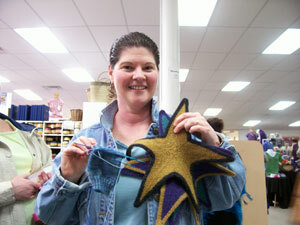 Lucy, owner of Mind’s Eye yarns was helping her to set up, and this is what they had. Is it just me or is that a lot of chairs? I stood there, stunned. That many chairs? This was going to be bad. This was going to be what my mother warned me about. This was going to be me, in a Masonic Hall with a bizillion empty chairs facing me while I spoke nonsense into a microphone. Couldn’t we just knit instead? I offered to go lie in the road, but they suggested I stay. I offered to help them put some chairs away. They declined. Against my better judgment, I stayed there, but did take out my knitting and stand quietly in the corner waiting for…I don’t know what. It wasn’t this though. 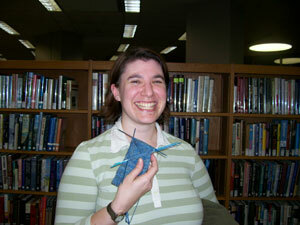 Briar, Suzanne (who completely addled my tired brain by spelling her name aloud to me “S. U. Zee A.N.N.E. I sat there looking at her for a minute until it computed. Zed. Zee. Same letter.) There was Patience and her charming mate..
Grumperina, Ms. Jaywalker herself, standing there looking like a mere mortal. Do not ask what the blue and white knitted object is in his hand. I assure you that it is largely innocent, but am a little creeped out anyway. Guido, dude. 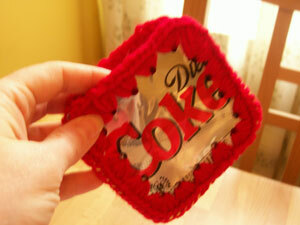 Sew that up so it stops being weird. 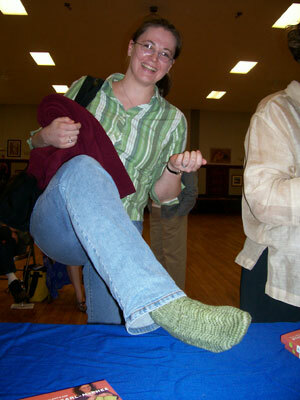 and Susan (sadly, blogless) showing off her very impressive, gold medal winning Olympic socks. Very, slick. Very. There were others, I loved them all. Sing out in the comments. 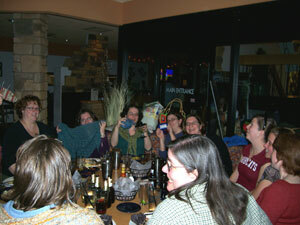 I went to dinner with some buddies from Team Boston, and Lucy the yarn shop owner, and after dinner? After a really fun dinner? Lucy opened the shop just for us. Life is sweet. Today I’m at Classic Yarns of Grafton, and I gotta go. Taxi’s waiting. The last week or so has been so surreal that blogging from the back of a taxi seems normal. Even rational. Things started to get strange when I got a call from the people who run my life Storey Publishing telling me that when I got through with the event in Philadelphia, that I should make my way to NYC for a quick radio spot. Okey dokey I think. No problem. (Well, I mean, going on the radio is always a problem, it’s a terrifying chance to say foul things live to many people if you muck it up, but at least it doesn’t matter if your fly is down or your hair is bad.) The surreal part started when they told me that it was Martha Stewart Sirius Radio. Martha? That Martha? Handmade gingerbread houses with delicate hand fashioned sugar windows Martha? Martha, the woman sent to this earth to remind me that I don’t iron enough? Martha? No thank you. I cannot speak to Martha Stewart. I am not worthy. I don’t own any matching towels and I burn cookies. I don’t accessorize myself, never mind my bedroom. I am not the sort of person to be anywhere near her. She wouldn’t like me. I am reassured when they say that It’s Martha’s show, but Martha doesn’t host it. It’s a call-in show hosted by some very nice ladies who aren’t as scary as Martha. I decided to turn up. That’s Martha radio. (Not the whole thing. Just part. 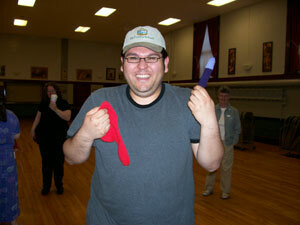 The sock was still a little intimidated.) I made my way there at 7am (after arriving in NYC at 2am) without coffee, (I can’t stress enough the significance that this all happened before coffee…) convinced security that there was no practical difference between my name, Stephanie Pearl-McPhee and the name they had on the list “Stephanie Pearl-MacPhee” (Get out of my way. Martha’s people are waiting for me.) and straggled upstairs where they slapped a headset on me and told me not to be nervous. First caller. A very nice lady who wasn’t scary at all. I start to relax. 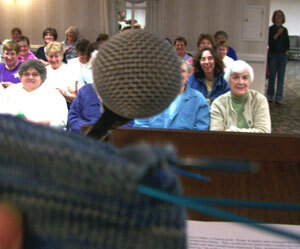 All I have to do is talk to knitters. 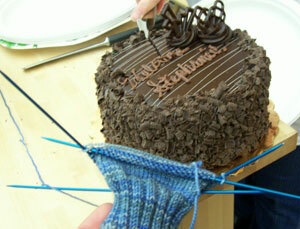 I like knitters. 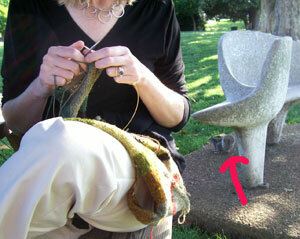 I talk to knitters all the time. This is going to be ok. It’s going to be fine. I’ll give you a minute to cope. Goodness knows I needed one. Just like that. Just like I wasn’t breaking blood vessels in my brain and hyperventilating. Just like a normal person would. Just like everything was ok. Then Martha was talking and my world was going black. She wanted to know about needles. I suddenly knew nothing. I answered anyway (probably a tactical error.) She wanted to know about wool. I babbled incoherently. She told me that you can’t knit in prison. 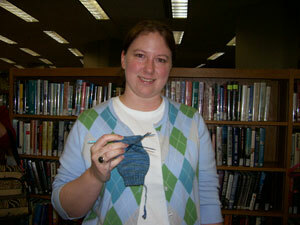 You have to crochet because prison doesn’t allow knitting needles. I said something like “Sure, yeah. You could give someone a nasty poke with a knitting needle.” then I think I laughed. Probably like a hyena on speed. Martha laughed melodically. I though about strangling myself with the headset cord or stuffing my mouth with yarn. “A nasty poke?” Who says that? Who tells Martha that? Someone stop me. 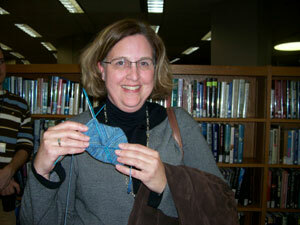 The next thing I know Martha says I’ve inspired her to knit (She lies beautifully.) the producers are thanking me and saying they will have me back…(lies, lies, more lies) and I’m back on the Avenue of The Americas trying to put it all back together. and wondering in a dazed sort of way if I was ok, or at the very least stupid enough to be entertaining. I’m really smarter than that. Poke. Good grief. This is Stacey. See that yarn in front of her? She spun that with her own two hands. See that spindle with the maple leaf on the front? She gave me both of them. The yarn and the spindle. 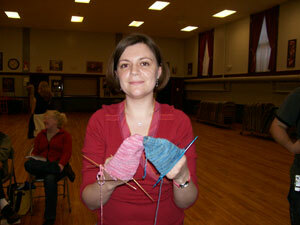 I am a very lucky knitter. I test drove the spindle that very night. It’s beautiful. 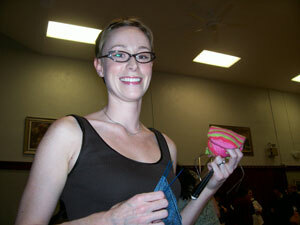 Jersey knitter (who did a fabulous game of link-o-rama, as well as some slick reciprocal blogging) with Peony knits. 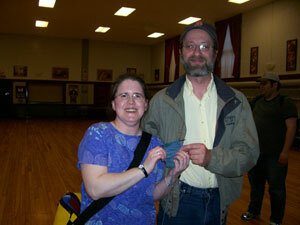 Charming Trek was in attendance as was the engaging Mary Beth, I got to see Annie Modesitt. 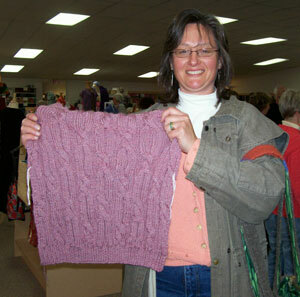 , after missing her while she was in Toronto for a trip, the knitters were everywhere at this event and I’ve got to tell you. 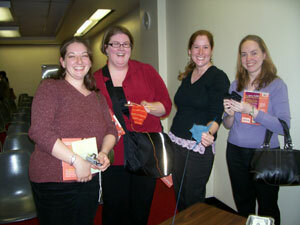 The Rutherford Library runs a heck of a knitting party. There was Elizabeth, a very young knitter (I haven’t forgotten to send you that pattern) , there were the nice people who run Yarnart (They make some cool stuff. Meg is currently enamoured of the one with sequins in it.) and a good time was had by all. (Well, likely all. Definitely me.) I returned to NJ in a fine mood, crashed at Juno’s for our last night together and wondered what I ever did to deserve such a great evening. Then I remembered. I’m fine. Didn’t mean to go so long between posts, but an impending set of twins sent up a warning flag over the weekend and I lost a bunch of organizational time to playing “find the fetal heart tones” in a Toronto hospital. Mum and babies are fine right now, but there’s no way that I’m going to get the 7-9 weeks of knitting time on these wee peanuts that I was hoping for. 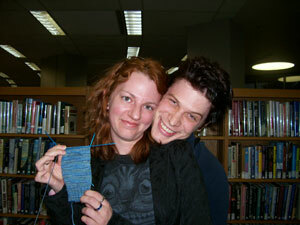 The babies are coming in that charming boy/girl pairing that’s so much fun for a knitter. 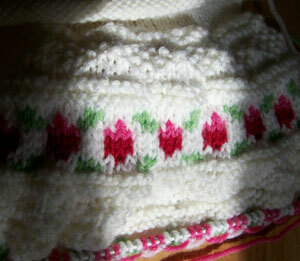 I’m knitting and packing and writing and cleaning up eggs so today you get a speed blog. Potomoto-mato-po-mus….something like that. It’s a charming pattern but I’ll be damned if I can get the name right. I’m enthralled by them. The pattern is not so nearly hard as it looks but I wouldn’t advise going nighty-night at any point in the chart. I’m on a plane tomorrow headed for the next stops on the book tour (I have never been so thrilled to be so exhausted and frightened) so I think I better wrap up where I’ve been before I get somewhere else. Loop in Philadelphia is a truly beautiful shop. I didn’t know this before I got there, so Juno and I planned a stop at Rosie’s on the way. I love Rosie’s. Every once in a while a knitter finds a shop where the owners sense and taste is in perfect harmony with their own and well. Rosie’s is not like that. Lisa’s sense and taste is far superior to my own. Just breathing the air in that place costs me money. I had a nasty accident there. The kind of accident Rachel describes where you slip and fall in a yarn shop and accidentally swipe your mastercard on the way to the floor? Yup. Diakeito Diarufran. 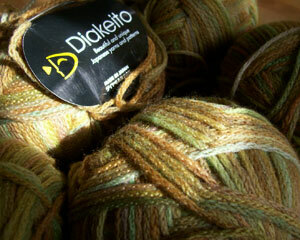 Beautiful Japanese chained yarn in all the colours of a soft forest floor. (Fetchingly named “211”.) 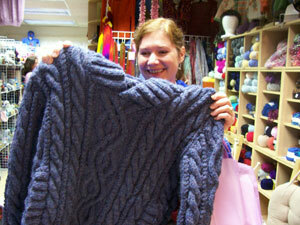 It’s a supersoft merino and has incredible yardage. I bought it so fast that I scared myself. I must have scared Juno too, since she slammed me, my new yarn and my still smoking credit card into the Junomobile and (after a really nice visit with Anj and Sue) whipped me into Loop, perhaps hoping that I’d taken the edge off at Sophie’s. Wrong. Loop is a beautiful store and now I was in trouble. 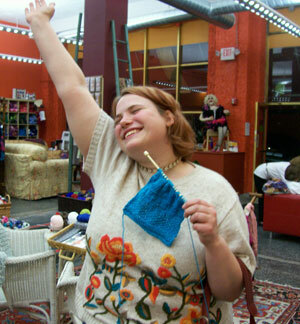 Two yarn shops in Philly as beautiful as the other. Different and charming. Ying and Yang. One a cellar with yarn for the discovering in every scintillating corner, one bright and airy with yarn gleaming at me from every surface, and knitters everywhere. They look like they are looking at me, but they are totally there for the yarn. Look at the glints in their collective eyes. 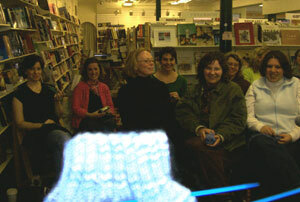 There was Sherry, knitty d, Chelle, Wendy , The Villiage Knittiot (I love that blog name) and, man. So many that I know I can’t possibly get them all. Sing out in the comments if I missed you. The lady who made my evening was Eliza. 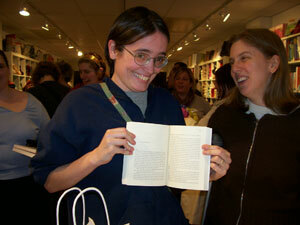 Eliza is seen here holding book 2 open to the page that (get this.) 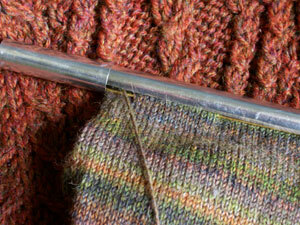 The page that made her knit socks. She was uninitiated, unknitterly. 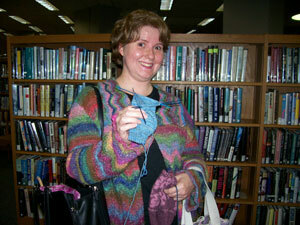 Lacking in the ways of wool and needles and the book corrupted her. 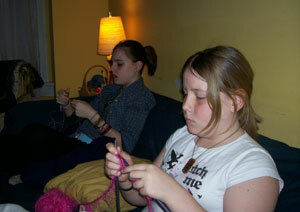 Something I wrote turned her into a knitter. My work in Philadelphia is done. Where was I ? Right. 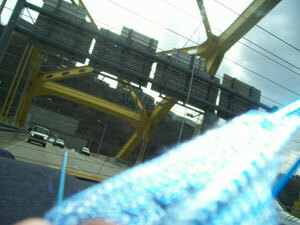 Finishing up in Pittsburgh, where knitters are friendly, the yarn shops terrific and every road leads to a bridge. Round about this time I had a life that looked only like this. I know. 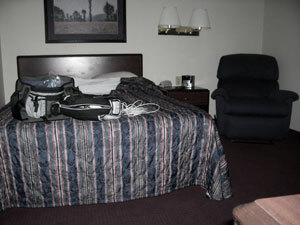 That’s the hotel room in Pittsburgh, and I’ve got to tell you, while it was very clean and comfortable, it had all the personality and soul of that guy Mark I dated in the 10th grade. (Mark actually had his mother call and tell me and cancel a date. Who does that? I had my mother call and dump him. I regret nothing. ) I believe that it was this bland hotel room that caused me to cast on this. Have you ever seen anything less Stephanie in your life? What was I thinking? 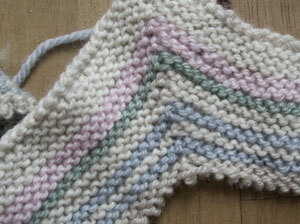 A baby surprise jacket (I love me the baby surprise jacket) in pastels? What was this doing in my stash? What sort of leaving home panic caused me to grab this? That will teach me to plan better. 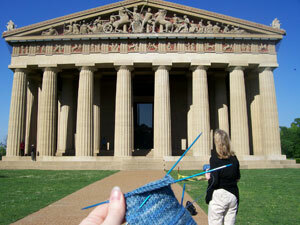 Never leave your knitting selections to the last minute. If it wasn’t for the hotel room I probably would have realized that I was knitting something I hated, but the carpet got to me and I kept going. Weird. In the meantime, the hotel had served it’s purpose, and after a very disturbing conversation with a night clerk at the hotel, (He writes sexual science fiction and wants the name of my agent. I didn’t give it to him. She can thank me later) I caught a deadly early shuttle to the Pittsburgh airport and flew to Philadelphia. I arrived at the Doylestown Bookshop via car, and the place was charming. Actually, all of Doylestown seems charming. Very white picket fence/ American family movie sort of place. The architecture is beautiful, the parks are beautiful and more than once I smiled as I drove through and saw all of the blossoming trees. (Toronto is not blossoming yet.) When I arrived at the shop they had 10 chairs set out, and were feeling pretty ready. (I have low enough self-esteem that this didn’t seem like it was going to be a problem.) 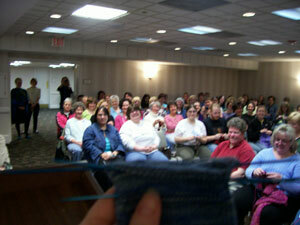 They assured me that A) I write knitting books. 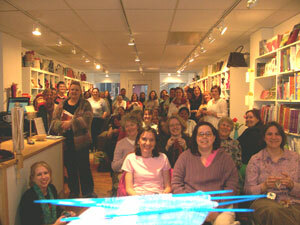 B) It was raining/snowing and C) I write knitting books. 10 chairs it was. These pictures were taken before everyone got there. 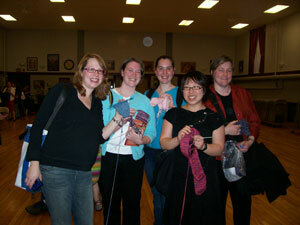 We ended up a team of more than 40 or 50 knitters. (I love freaking the muggles out.) There was Liz (In a great sitcom chic. Every time I see that sweater I think over knitting one.) Laurie, who was way more smooth than she thinks she was, Amy and Francesca, Chrissy (who was surprised I knew her blog. 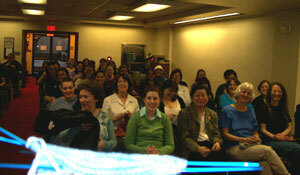 TIP: The blogosphere is a community. I read your blogs, you read mine. Neat, eh?) Mark (excellent taste in yarn.) Buttercup, the fabulous S.Kate (live and in the flesh) Regina, who’s socks looked self patterning and absolutely . Were. Not. 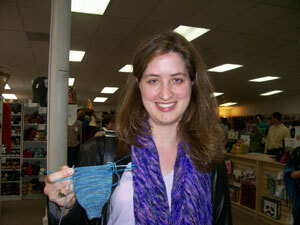 She and I left with S.Kate, visited the nearby Yarn shop (What was the name of that place? Forever yarn? She had fleece artist.) and we made our merry way to a restaurant for lunch where I enjoyed S. Kates company and was able to thank her in person for all that she did to make the Olympics work, and for how generous she is with KWB. It was, once the thanking was done (thanking is not so funny) one of the funniest meals I have ever snickered my way through. S. Kate was spindling suri alpaca, and it was everywhere. Everywhere. 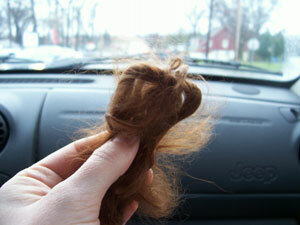 Webbing her to the seat, on her leg, in her hair and in this picture, though you can’t see it…. We parted in the parking lot and Juno and I began the drive back to NJ. We drove for a bit, reflecting (read giggling ourselves stupid) on what a fun time it had been, then fell into a quiet silence, while I chose CD’s for the ride and we stopped for a red light. It was at this exact peaceful moment that someone ran up to the side of the car, knocked on the window and held something up, momentarily terrifying both Juno and I. It was S.Kate. It was a Suri sample. She thrust it into the car, said “I’m so glad it was your car” and bolted. I had no idea what day of the week it was any day that I was gone. I have gone back and with the help of the itinerary, people who claim to have seen me and blogged about it, and the receipts for yarn I found in my purse. (Those were a big help) I have pieced together the description of the truck that hit me events of the last several days. It would appear that after Skaneateles I flew from Syracuse to Newark, (Hey! I remember that! I saw the Statue of Liberty from the plane. I’d never seen it before and I was pretty thrilled. I’ve been in NYC a couple of times now, and even though it was supposed to be pretty big, I could never locate the thing. I was starting to think that it was either a lie Americans tell Canadians for fun, or maybe that the little statues in the souvenir shops were “life size”.) I changed planes in Newark (My flight was delayed. The Newark airport needs better/closer coffee.) and I got on a flight to Pittsburgh. Pittsburgh is a cool city. It’s very pretty, which I never expect, and my favourite thing about it is arriving. You drive along this road from the airport that has no hint of a city about it, then you go into a tunnel and when you come out of the tunnel…whammo. Pittsburgh, with all of the green and the hills and the rivers is right in front of you. It’s a surprise city. Nothing, then the tunnel…then there it is. The cab driver said it was a city with a front door. It was at this point, just about, that I apparently took leave of my intelligence. Everything happened so fast. As far as I can recollect, my fly was up, I don’t think I said “arse” (or anything worse) I’m pretty sure I spelled my name correctly in all the books and the rest is a blur. You should have been there. It was incredible. 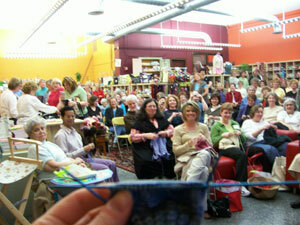 Knitters as far as the eye could see. 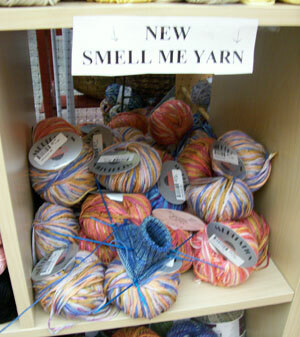 And the store had beautiful yarn. Beautiful. 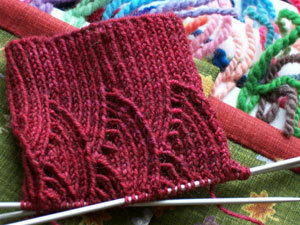 I bought some Claudia sock yarn as a souvenir and it’s thing of charm and wonder. 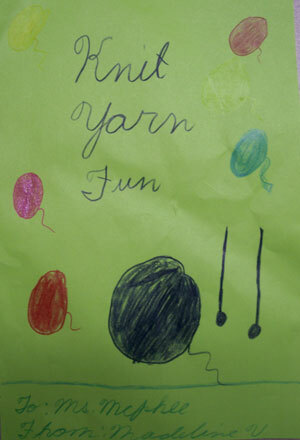 There was also this yarn. Seriously. it’s an “aromatherapy” yarn with a scent that’s supposed to last for 40 washes. There are no words for how interesting I find this. I don’t know if I’m intrigued, appalled or charmed. (The sock was similarly confused.) Aromatherapy yarn. Am I the only one who’s sort of surprised by this? Am I the only one who thinks that the different colours should be different scents? Am I the only one standing stunned over this in yarn shops? Pittsburgh, many, many thanks. I had a wonderful time…it was a blast. More tomorrow as I reconstruct Doylestown, Philadelphia, Rutherford, and …I swear it…. Talking to Martha Stewart on the phone.